Doctor Who fans! The adventure continues for lunchtime, game time, or party time! 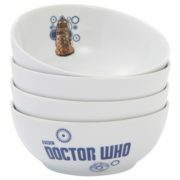 This is a set of four, 6.5 inch, ceramic bowls that features Daleks and logos from the long running British sci-fi TV series Doctor Who. These bowls feature a high quality design and are packed in an illustrated box. This is a 100% polyester necktie which features the colors of the 4th Doctor, as played by Tom Baker, from the long running BBC TV series Doctor Who. 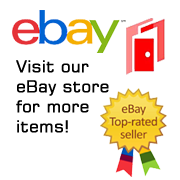 It measures approximately 56.6″ long and up to 3.5″ wide. This is an authentic licensed knitted 17 Foot long premium scarf as worn by the 4th Doctor, Tom Baker, as seen on the long running British sci-fi TV series Doctor Who, along with a licensed brown suede like hat worn by the 4th Doctor. The scarf is knitted acrylic and is a new and unused scarf with tags attached. 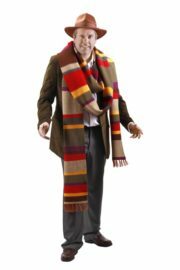 This is an authentic licensed knitted 12 Foot long (actually 143″ but what is an inch among Who fans) scarf as worn by the 4th Doctor, Tom Baker, as seen on the long running British sci-fi TV series Doctor Who. This is the purple version. It is knitted acrylic. 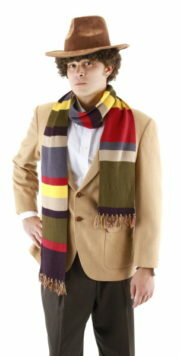 This is an authentic licensed knitted 17 Foot long premium scarf as worn by the 4th Doctor, Tom Baker, as seen on the long running British sci-fi TV series Doctor Who. It is knitted acrylic and is a new and unused scarf with tags attached. 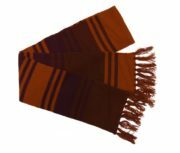 This is an authentic licensed knitted 6.5′ scarf as worn by the 4th Doctor, Tom Baker, as seen on the long running British sci-fi TV series Doctor Who. It is knitted acrylic and is a new and unused scarf with tags attached and is stored in a smoke and pet free environment. This is an authentic licensed knitted 6.5′ scarf as worn by the 4th Doctor, Tom Baker, as seen on the long running British sci-fi TV series Doctor Who. This is the purple version and it is knitted acrylic. 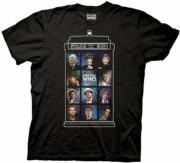 This is a black t-shirt bearing the image of all eleven doctors in the Tardis Police Box, from the long running British sci-fi TV series Doctor Who for their fiftieth anniversary. 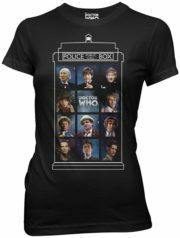 This is a black baby doll t-shirt bearing the image of all eleven doctors in the Tardis Police Box, from the long running British sci-fi TV series Doctor Who for their fiftieth anniversary. 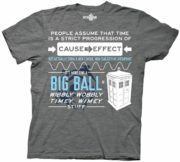 This is a heather gray t-shirt bearing the explanation and quote of how the Tardis works, from the long running British sci-fi TV series Doctor Who. Produced in 2012, this is a licensed, large 2 1/8″ x 3″ magnet featuring an image and name of one of the episodes starring Matt Smith as the Doctor from the Doctor Who British TV series. This is a new, unused magnet. This is part of the FUNKO line of POP! vinyl figures and this series features characters from the long running British sci-fi TV series Doctor Who, measuring 3.75″ high. This is a black baby doll/juniors style women’s t-shirt bearing the images of the 11 different Doctors, along with the Tardis, who have appeared on the long running British sci-fi TV series Doctor Who. This is a new, never worn shirt. 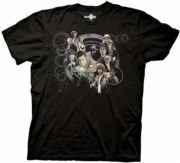 This is a black t-shirt bearing the images of the 11 different Doctors, along with the Tardis, who have appeared on the long running British sci-fi TV series Doctor Who. This is a new, never worn shirt. 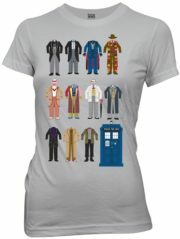 This is a silver baby doll/juniors style t-shirt bearing the image of all eleven outfits worn by each Doctor and a Tardis, from the long running British sci-fi TV series Doctor Who. This is a new, never worn t-shirt. Printed in 2012 by Culturenik, this is a 24″ x 36″ poster bearing the images of the 11 different Doctors, along with the Tardis, who have appeared on the long running British sci-fi TV series Doctor Who. Printed in 2013 by Culturenik, this poster has silhouette images of all 11 Doctors with a Diamond name logo in the middle from the long-running and highly popular British science fiction TV series Doctor Who. Printed in 2013 by Culturenik, this poster has vertical images of all 11 Doctors with Matt Smith in the middle from the long-running and highly popular British science fiction TV series Doctor Who. 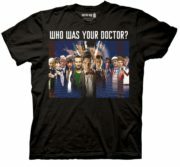 This is a black t-shirt bearing the vertical montage of all eleven Doctors under the words “Who was your Doctor?” from the long running British sci-fi TV series Doctor Who. Printed in 2011 by Culturenik, this horizontal poster depicts the Doctor as played by Matt Smith with his companion Amy and the Tardis as seen on the long-running and highly popular British science fiction TV series Doctor Who. 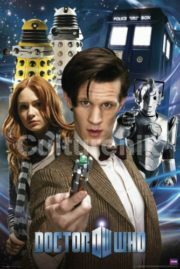 Printed in 2011 by Culturenik, this poster depicts the Doctor as played by Matt Smith with his companion Amy and a collage of the Tardis, Daleks and a Cyberman behind them as seen on the long-running and highly popular British science fiction TV series Doctor Who. 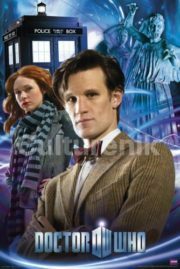 Printed in 2011 by Culturenik, this poster depicts the Doctor as played by Matt Smith with his companion Amy, the Tardis and weeping angels behind them as seen on the long-running and highly popular British science fiction TV series Doctor Who.